The award winning Kids' Court School is possible because of our dedicated students at the UNLV Boyd School of Law and students at the University of Nevada, Reno. The William S. Boyd School of law is dedicated to serving the Las Vegas community.through the community service program. All Boyd students participate in the mandatory community service program teaching free legal information classes to citizens of Nevada. Boyd community service students participate in our Kids' Court School, conducting mock trials to educate children about testifying in court. Learn more about the William S. Boyd School of Law Community Service Program. After completing the required community service program, law students who continue with Kids' Court are trained in the Kids' Court curriculum and supervised by the Kids' Court director and administration to volunteer as courtroom educators. Student volunteers also help with research and development of future Kids' Court programs. 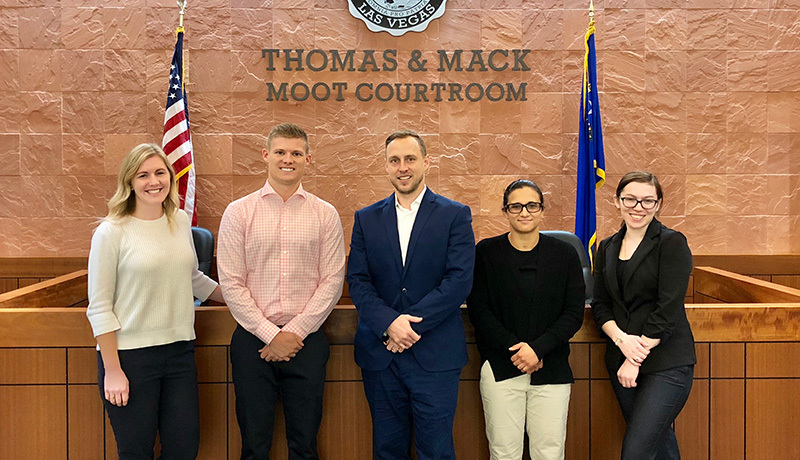 At the University of Nevada, Reno undergraduate and graduate students volunteer their time to conduct the mock trials.